What is Green & Black’s Velvet Edition? The new Green & Black’s Velvet Edition range has been created for those chocolate lovers who are attracted by Green & Black’s promise of finest ingredients and ethically sourced cocoa, but may associate the taste with more complex, strong flavours. The new range has been expertly crafted by our team of chocolate experts, who have created a smooth texture with nutty, vanilla notes made with high quality, ethically sourced cocoa beans. 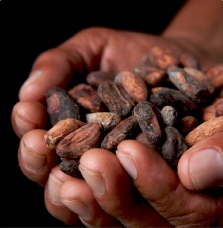 We are proud that our new range will be made from sustainably sourced cocoa from the industry leading Cocoa Life programme, a $400 million programme to secure a positive future for 200,000 farmers and 1 million community members in six key cocoa growing origins by 2022. Working in partnership with Fairtrade, Cocoa Life focuses on securing the long-term future for cocoa farming communities. The Green & Black’s Velvet Edition provides a new signature taste that is the perfect entry point for people to discover the Green & Black’s family and sits alongside our classic range, which will continue to be organic and Fairtrade certified. We are proud that Green & Black’s Velvet Edition range will be made from sustainably sourced cocoa from the industry leading Cocoa Life programme, a $400 million programme to secure a positive future for 200,000 farmers and 1 million community members in six key cocoa growing origins by 2022. 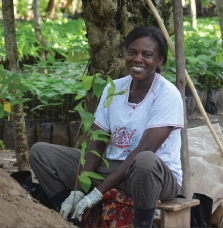 Cocoa Life focuses on securing the long-term future for cocoa farming communities. 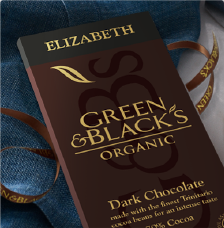 Green & Black’s organic range, loved for its unique recipe and enjoyed for its savoury, more complex undertones, strong taste and long-lasting finish, is Fairtrade certified and made with organic cocoa beans. Green & Black’s Velvet Edition range is made from sustainably sourced cocoa from the industry leading Cocoa Life programme. Cocoa Life is a $400 million programme to secure a positive future for 200,000 farmers and 1 million community members in six key cocoa growing origins by 2022. Working in partnership with Fairtrade, Cocoa Life focuses on securing the long-term future for cocoa farming communities. This move, to add Cocoa Life to Green & Black’s Velvet Edition is part of a $400 million investment to expand Cocoa Life and to enable more beans to be sustainability sourced, reaching more farmers. Cocoa Life has already had significant impact on delivering benefits to its partners and it communities. All of our products in the Green & Black’s Organic range are certified by the Soil Association, the UK's leading organic certification body. All of our organic products are inspected at least once a year to ensure the standards continue to be met. For more information, visit The Soil Association www.soilassociation.org. 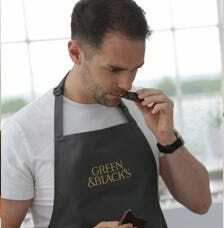 The Green & Black’s Velvet Edition range has been specially created for people to discover the Green & Black’s family. We know there are chocolate lovers who are attracted by Green & Black’s promise of finest ingredients and ethically sourced cocoa, but may associate the taste with more complex, strong flavours. The new Velvet range has a smooth, velvety texture with nutty, vanilla notes. 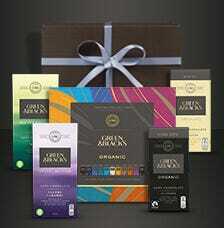 It is made with high quality, ethically sourced cocoa beans. These beans have been deliberately chosen for their distinctive taste, and are sourced from Ghana in West Africa, and are not available to order in organic bulk. All products across the Green & Black's ranges are suitable for vegetarians. Regarding Vegan suitability, we can confirm that our milk and white chocolate products contain milk powder within the recipe. Milk powder is not added as an ingredient to the dark chocolate variants in our range, including our Cocoa Powder and Hot Chocolate drinks. However, our products are not produced in dairy-free sites and at some stage in the production process, dark chocolate uses shared lines or equipment that handles milk ingredients. This, according to our risk assessments, highlights there is a potential risk to cross contamination even after our strict cleaning regimes. Consequently, in order to highlight this risk, these products carry a ‘may contain milk’ warning on the packaging. All our products are made in factory which handles nut ingredients and therefore we cannot guarantee that any of our products are totally nut-free. Although we do not use peanuts in our recipes or factories, we cannot actively make the guarantee that our chocolate is peanut-free as there may be the presence of peanuts further down the supply chain which is out of our immediate control. Do your products contain wheat or gluten? The majority of our chocolate bars are made in a factory that does not permit handling of ingredients containing gluten. However, some products within our range are produced at different factories which, due to shared equipment, may be at risk of cross-contact with gluten ingredients. Products considered to be at risk of cross contamination will carry a ‘may contain’ warning. Are your products suitable for Diabetics? Our Dark chocolate bars are fairly low in sugar content and thus may be suitable for consumption in small amounts for diabetics. 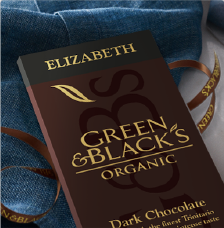 Our Green & Black’s Organic plain Dark bars come in two varieties – the 70% Cocoa solids, and the 85% Cocoa solids. As these two bars have such a high cocoa content, they will naturally carry less sugar than the other bars. However, the 70% bar still contains almost 30% sugar (29g of sugar per 100g) and the 85% bar has just below 15% sugar (13.5g per 100g). The Green & Black’s Velvet Edition plain 70% cocoa bar contains (27g of sugar per 100g). We would advise all people with diabetes to consult their doctor or registered dietitian for advice or visit Diabetes UK website (www.diabetes.org.uk) for further information. Do your bars contain alcohol? All of our chocolate bars are complemented with vanilla extract which contains alcohol as a carrier but we can be confident that there is no alcohol left in the chocolate at point of consumption. The flavour is added at the conching stage of the process where the chocolate is blended and worked at temperatures of 70°C for many hours. The flash point of the flavour and the alcohol will ensure that it will be driven off or evaporated during this process. Therefore, although alcohol is present in the flavouring, it will have been removed by the process before consumption. Are the Eggs in Green & Black’s Ice Cream Pasteurised? The whole eggs and dairy ingredients in our ice cream are bought in to the factory ready-pasteurised and then re-pasteurised as part of the entire ice cream mix before they are frozen down. If you are unsure of the correct diet to eat during pregnancy, we recommend that you contact your doctor or health advisor for advice. 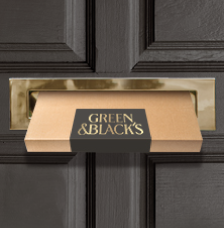 Green & Black's products are widely available across the UK. Most major supermarkets stock a range of our products as do many health food shops. There are also several online retailers who offer a range of our products. We would suggest you speak to the in-store manager regarding availability in your local store. Chocolate should be kept in a cool, dark place, with a temperature of less than 20 degrees centigrade. 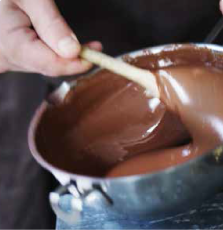 It should also be stored away from strong odours as chocolate will absorb other flavours due to its high fat content. Lots of people like to keep their chocolate in the fridge which is also fine but it is advisable to store it in a Tupperware box– again, to ensure it doesn’t become tainted by strong flavours from other foods in the fridge.